The following article was published in the July-August edition of Socialism Today. We are publishing here today because, in light of Trump’s victory, the anti-establishment revolt that shook British society contains many parallels and lessons for the new situation in the U.S. 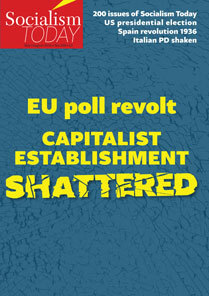 The vote to leave the EU has rocked capitalist institutions – in Britain and internationally. It is yet another reflection of the anger at mass poverty and savage austerity – and of the growing anti-establishment mood. And now the political aftershocks are beginning to reverberate. PETER TAAFFE writes. The victory for the leave camp in the referendum has already had massive repercussions for the future of Britain and, particularly, for the labour movement here as well as in Europe. The vote – 52% to 48% – represents at bottom a predominantly working-class revolt against austerity and the Tory millionaire government of David Cameron and George Osborne which has laid waste to living standards and working-class communities. It is totally false to draw the utterly pessimistic conclusions which some small left groups have done that this result could lead to a ‘carnival of reaction’ in Britain and encourage right-wing forces in Europe and elsewhere. No doubt the European right will seek to exploit its outcome. But reports from the Left Bloc conference in Portugal, held immediately after the result, showed that representatives of the workers’ movement in Greece, France and Spain have been given a boost by the British referendum outcome. It is not automatic that reaction – through a figure like Boris Johnson or Michael Gove – can inherit the crown from Cameron and establish a firm base without the challenge of a general election, in which they can be defeated. The day before the referendum, teachers showed defiance of the government’s plans for academies by voting by over 90% for strike action on 5 July. In fact, a mini-strike wave is unfolding in Britain, including on Southern Railways and strikes involving the Bakers Union. Many workers who have come into conflict with the government seized hold of the opportunity presented by the referendum to strike a blow against the main enemy – the hated Cameron and Osborne. What it did not represent was a vindication of Johnson. On the contrary, the day after the referendum he was booed outside his house, and not just by the ‘Remain’ side. Also, in the days after the referendum, Socialist Party paper sellers on the streets met many who had voted remain and yet, through discussion, were convinced of our class arguments for leave on a socialist basis. This gave a glimpse of what would have been possible if the labour movement leaders had not lined up behind the austerity commander-in-chief, Cameron, who has now been consigned to the dustbin of history, as we predicted he would be if he lost the referendum. The relationship of forces between the organised working class and its allies and the government can be strengthened in favour of the trade union and labour movement, if it draws bold fighting conclusions from the outcome of the referendum. Without in any way prettifying all the forces involved on the leave side, the results of the referendum represent a major uprising of ordinary working-class people against the ruling elite. It is true that the binary choice of a referendum allows participants to vote on the same side as those who have quite different and opposite class reasons. This can politically skew the outcome, making it difficult to draw clear general conclusions. But not in this case. Traditional Labour areas and regions voted heavily against the government led by the two ‘big butchers’, Cameron and Osborne, with only Northern Ireland, Scotland and London voting for remain. Even where remain won a majority there was an unmistakable working-class determination to show ‘them’ – the Tories and the remain elite – that ‘enough is enough’. On the other hand, an estimated three quarters of young people who voted went for remain, which was a distorted but nevertheless understandable expression of an internationalist approach. They mistakenly saw the EU as a progressive factor – an openness towards Europe and the world. This was cynically exploited by the Tory ‘remainers’ and their supporters. As the Socialist Party consistently pointed out, the EU is a neoliberal construct, a capitalist and imperialist exploiter not just of the European working class but, through its trade deals, a collective oppressor of the masses in the neo-colonial world. There was a steely determination in many working-class areas in particular to turn out and vote leave. This was despite the unprecedented ‘project fear’ and hate campaign, with an array of bourgeois economists lined up predicting that the roof would fall in, there would be a new economic crisis, as well as Armageddon, and a third world war if the ‘people’ did not vote ‘the right way’ – that, is for remain. There was a determination to give the ‘toffs’ a bloody nose – those who do not have to live in the deprivation that the Tories and capitalism have created. There was an unprecedented mass participation in some working-class areas, including on council house estates, with the overall turnout an impressive 72%, higher than in the general election. It is true that the racist UK Independence Party (UKIP) was for leave, as was the Tory capitalist brutalist duo of Johnson and Gove, with an emphasis on scapegoating immigrants. Some workers were no doubt seduced by the anti-immigrant message of these reactionary forces. This was particularly the case because the official leadership of the labour movement, both within the Labour Party and the trade unions, played into their hands by completely abandoning an independent socialist, class and internationalist programme. The Socialist Party adopted such a class approach – both in this referendum and the one in 1975, when Jeremy Corbyn also held a similar anti-EU position. Now, unfortunately, Jeremy was trapped behind enemy lines, hemmed in by the Blairite remain creatures. And they have rewarded him with Hilary Benn and other plotters organising a coup against him. The right of the Labour Party would blame him for everything, no matter what he did, including the weather. They forced him – quite clearly reluctantly – into a remain position. He was damned if he did and would have been even more attacked if he didn’t! We pointed out during the campaign that if he would have come out clearly against the EU on socialist and internationalist lines, demanding a socialist Britain linked to a socialist confederation of Europe, he would have been in a stronger position. The choice then would not have been between two Tory gangs but a new general election in which the whole lot could be thrown out. The relationship of forces that could have developed out of such a campaign would have meant that this would immediately get a favourable response. Many workers rejected the racist programme of division but had legitimate concerns about the heavy pressure in crowded working-class areas on limited resources, school places, housing, etc. There is a real fear of a race to the bottom as even more low-paid, zero-hour jobs are created. The solution to this problem lies not in scaremongering against immigrants but in a programme which demands increased resources, particularly through the building of council homes, as well as a crash building programme for schools, rather than on the divisive academies that are planned. There are 50,000 empty properties in London alongside eleven million in the EU as a whole. Not a whiff of such a programme was heard during the campaign from the right-wing summits of the labour movement who spent their time appearing alongside vicious representatives of the class enemy in either the remain or leave camp. We were treated to the spectacle of the mayor of London, Sadiq Khan, appearing with Cameron and ‘taking on’ Johnson in the defence of the capitalist EU. Previously in the mayoral contest he came out for more billionaires for London – it already has 141, the highest number in the world! This allowed Johnson to demagogically denounce the inherent inequality of the EU and to obscenely present himself as a defender of the ‘little man and woman’. Tony Blair, accused during the Iraq war of ‘lying as he breathes’, reverted to type when he suddenly began to champion the rights of trade unions. In an article in the Daily Mirror, he had the gall to write “don’t abandon workers’ rights”. Yet he had spent thirteen years in power maintaining intact all of Margaret Thatcher’s anti-union laws! The hapless general secretary of the Trades Union Congress (TUC), Frances O’Grady, woefully declared that workers would lose £38 a week by 2030 unless they lined up behind the bosses’ EU. It was the EU, not the trade unions as fighting organisations, which was scandalously presented in this way as a progressive vehicle for defending and lifting the living standards of working people. There could not be a greater expression of the complete bankruptcy of what is the leadership of the major workers’ organisation in Britain. The trade unions have found themselves in this baleful position because of their adaptation to the capitalist EU. In 1988, the EU Commissioner Jacques Delors offered to rescue the trade union leaders from the debilitating defeats in that decade – the miners’ strike, Wapping, the collapse of the struggle against council rate-capping – by selling the idea of a ‘social Europe’. This was always a false prospectus. Any legislation ratifying the rights of workers can only be achieved and maintained on the basis of struggle and industrial strength. But the trade union leaders, in gratitude, sang the French song ‘Frère Jacques’ to him for opening up a seemingly painless means of maintaining workers’ rights. From this flowed class collaboration policies like ‘partnership’ which, on the basis of a boom, could result in limited benefits during a period of economic upswing. But when the economic crisis struck – particularly since 2007-08 with its consequent historically extremely feeble growth – this has turned into the opposite: stagnant living standards and attacks on past gains on all fronts. It was quite scandalous that, faced with the recent offensive of Cameron and Osborne against trade union rights, the TUC did not organise effective industrial action. They then compounded this retreat by offering a trade-off to the government. They would campaign to remain in the EU if the government would make some concessions on issues such as the check-off scheme, etc, which the government duly promised to carry out. The arguments of Blair and O’Grady that the EU protects the rights of working people through measures such as the working time directive is completely bogus. Any legislation that is introduced which may favour workers and the trade unions is the result, ultimately, of the power and organisation of the unions and not some innately ‘progressive’ inclination of the employers’ organisations, including the EU. Moreover, during the referendum campaign some of the more brutal and venal employers – like the airlines EasyJet and Ryanair – demonstrated just how they were prepared to consider strike-breaking when it suits their purpose, irrespective of any EU regulations. They proposed to the EU that it coordinates action in the summer to circumvent the effects of any industrial action by French air traffic controllers by allowing German controllers to take over their work. Let us remember that it was Ronald Reagan who initiated the dark era of neoliberalism in the US by firstly taking on and defeating air traffic controllers in 1981. The conditions that were then set became the benchmark for all other employers throughout the US. The fact that such measures can now be proposed for the EU indicates its vicious neoliberal character.It should be sufficient to mention the record of the EU on the issue of privatisation alone, for instance in relation to Greece, to implacably oppose remain on sound trade union principles. The EU has just forced on Greece a mass privatisation programme of 71,000 pieces of property and businesses, including selling off regional airports. A ‘progressive” EU to a Greek worker is in complete contradiction to their experiences at its hands! Millions are being forced back to live on the meagre pension of just one family member. There is no doubt that the struggles of the Greek workers will have been given an enormous boost by the defiance of the British working class in the course of the referendum. A new domino theory is posed for Europe, with the repercussions of the events in Britain reflected in a similar leave pattern in other countries, such as the Netherlands and Sweden, and maybe even Italy. They can follow the path of workers in Britain, not by reinforcing nationalism but by creating real solidarity among the workers of Europe on a trade union and political level, linked to the prospect of socialism. As we have argued since the inception of the predecessor of the EU – the Common Market – despite all their efforts, capitalism will never be able to carry through the real unification of Europe. Some Marxists challenge this and even invoked during the referendum campaign the writings of Leon Trotsky to justify their support for remain – and the idea that capitalism can actually carry through the historic task of unification and that this would be ‘progressive’. Such a conclusion – allegedly based on Trotsky’s writings – is false to the core. The urge to unify the continent flows from the needs of production and technique in the modern era. The productive forces have outgrown the narrow limits of private ownership by a handful of capitalists, on the one side, and the nation state, on the other. Modern industry – particularly the big monopolies, transnationals, etc – plan not just in terms of the markets of a country but of continents, and the biggest firms in terms of the whole world market. This expresses itself in the tendency towards the elimination of national barriers, limits on production, tariffs, etc, which goes alongside the creation of giant trading blocs like the North American Free Trade Agreement (NAFTA) and the Transatlantic Trade and Investment Partnership (TTIP). This process can be carried very far during a boom, as in the case of the EU. This happened in the ‘noughties’. This allowed some sections of the capitalists and, unfortunately, some Marxists to dream that capitalism could actually overcome national limits and proceed towards a unified European capitalist class. Trotsky was quite clearly dealing here with a hypothetical situation which, moreover, he did not expect to materialise. It is also not a description of the EU, which has not ‘merged’ the nation states of Europe. He goes on to argue in the same article that “the democratic republican unification of Europe, a union really capable of guaranteeing the freedom of national development, is only possible on the road of a revolutionary struggle… by means of uprisings in individual countries, with the subsequent merger of these upheavals into a general European revolution”. The situation in Britain prior to the referendum and particularly following the results – expressing as it does the stoked-up anger of the working class against the Cameron/Osborne junta – offers a unique opportunity to completely transform the situation in favour of the working class. Even before the referendum the government had been compelled to undertake 20 u-turns or partial u-turns with the wheels threatening to come off the Tory chariot. It remains besieged on every front with the economy heading for another crisis, with the biggest trade deficit since 1948 – notwithstanding recent improvements. Unemployment has risen among young people and the catastrophe of the housing situation in London and other big cities continues unabated. One borough, Waltham Forest, has seen a 25% increase in the cost of houses in one year, while workers on the Butterfields estate face eviction and being sent into ‘internal exile’ to cities hundreds of miles away. This is so that rack-renting owners and landlords can sell off their humble dwellings to the well-off who are pouring in to snap up houses with vastly inflated prices. There is also a brewing revolt on wages which have dropped by 8% since 2007. This, let us remind TUC leader, Frances O’Grady, was when Britain was part of the EU! There is a growing revolt within unions, reflected at a number of their recent conferences. The Welsh TUC, due to the pressure from Socialist Party members, passed a series of motions, including support for council ‘needs budgets’, and were very sympathetic to the idea of the nationalisation of steel. These were passed virtually unanimously, with new and younger layers of workers in particular attending the gathering for the first time. At the GMB general union conference, motions for nationalisation appeared on the agenda for the first time in a long time. At the conference of the public-sector union, Unison, a new rank-and-file left organisation has been formed to spearhead the drive to transform this union from a moribund ‘witch-hunting’ outfit into a fighting, militant Unison able to mobilise the resistance of members. These all betoken a new combative era in Britain. At the same time, two “civil wars” – one in the Tory party, the other within Labour – have intensified in the wake of the referendum. As could have been predicted – and was by the Socialist Party – the attempt to mollify the Labour right by Corbyn’s supporters in Momentum and others, by moving to the remain camp during the referendum campaign, has not lessened their opposition to Corbyn but emboldened them. Within hours of the result, Margaret Hodge MP circulated a letter to the Parliamentary Labour Party for a motion of no confidence and a new leadership contest in a campaign with the obvious intention of removing Corbyn. The firing of Hilary Benn and the resignations of other shadow cabinet members followed. Clearly, the Labour Party remains in a halfway-house position – locked in an ongoing civil war between the rotten forces of the Blairites and anti-austerity, potentially increasingly socialist forces gathered around Jeremy Corbyn. But the opportunity had been squandered by the ‘left’ petty-bourgeois forces leading the pro-Corbyn organisation, Momentum. It initially promised an open and democratic regeneration of the labour movement with the centralised bureaucratic structure of Labour Party of the past swept away. However, under the disastrous sway of its current leadership, particularly Jon Lansman, the early promise evaporated as this leadership attempted to mollify the right. This served to embolden them in their determination to remove Corbyn and reinstitute the rule of the Blairites. Distrust of the right led the conference of the PCS civil service union to defeat a motion for affiliation to the Labour Party at this moment in time because the Blairite right still controls the party’s machine, particularly the Parliamentary Labour Party. Indeed, during the referendum campaign, 71 ‘fieldworkers’ were allocated by the Labour Party HQ to work for the defeated remain camp. PCS members were mindful of the fact that affiliation would require them to finance this Labour machine which, through the so-called ‘Compliance Unit’, acts as a right-wing barrier – a filter – to keep out of the Labour Party any working-class fighters who want to return the party to the path of socialism and struggle. If they cannot succeed in this task, the right is once more preparing to split the Labour Party. The referendum indicated this already through the close collaboration between ‘left-wing’ Tories and the Labour right. This unbelievably led to a proposal, which was not carried through, that MPs of both government and opposition sit on both sides of the House of Commons during the special session after the murder of the Labour MP, Jo Cox. During the remain campaign there was already an element of a national coalition – with right-wing Labour cosily collaborating with the ‘left’, ‘liberal’ Tories, as well as the Liberal Democrats. Indeed, the Lib-Dem leader, Tim Farron, concentrated all his initial post-referendum remarks on attacking Jeremy Corbyn for being insufficiently ardent in support of remain. So the civil war within the Labour Party which has existed since Corbyn’s election continues unabated – scarcely a day has gone passed without some attack aimed against him. The ‘blue-on-blue’ attacks – between Tory ‘friends’ – have also left lasting divisions between the Cameron/Osborne wing of the Tory party and the Johnson/Gove outfit. A new Tory leadership contest will widen these divisions and could result in an open separation, leading to some kind of alliance with the right of the Labour Party and also drawing in Liberal Democrats. The referendum was similar to a giant boulder being dropped into a lake with the ripple effect likely to last for months and years. It has already reverberated throughout Europe and could lead, ultimately, to the collapse of the euro and the break-up of the EU. It has posed the question of a new Scottish referendum which could lead to the splintering of the UK. The ramifications are also serious for Ireland, particularly for Northern Ireland, where a new ‘border poll’ has been demanded by Sinn Féin, which could ratchet up sectarianism in turn. However, in all the developments which will flow from the referendum, the labour movement must draw clear socialist conclusions and act accordingly by fighting on an independent working-class programme. The immediate demand is to fight for a democratically convened emergency labour movement conference, open to all pro-Corbyn left forces. The aim of such a conference should be to defend Jeremy Corbyn by defeating the attempted coup of the PLP plotters – by adopting clear socialist policies and democratic structures including a federal form of organisation. The EU referendum was an earthquake for the ruling class and their shadows in the labour movement, and the aftershocks will continue for some time. At the same time, it is a big opportunity to reconstruct the labour movement on democratic and socialist lines.